Check out the similarities between the covers of The Fury of Firestorm: The Nuclear Men #13 (shipping in Oct. 2012) and Firestorm the Nuclear Man #65 (cover dated Nov 1987)! Below is Fury of Firestorm: The Nuclear Men #13 cover by Dan Jurgens & Norm Rapmund! Below is the cover to Firestorm The Nuclear Men #65 by Ross Andru! Both are great covers! While the covers aren’t exact matches, there are several similarities. 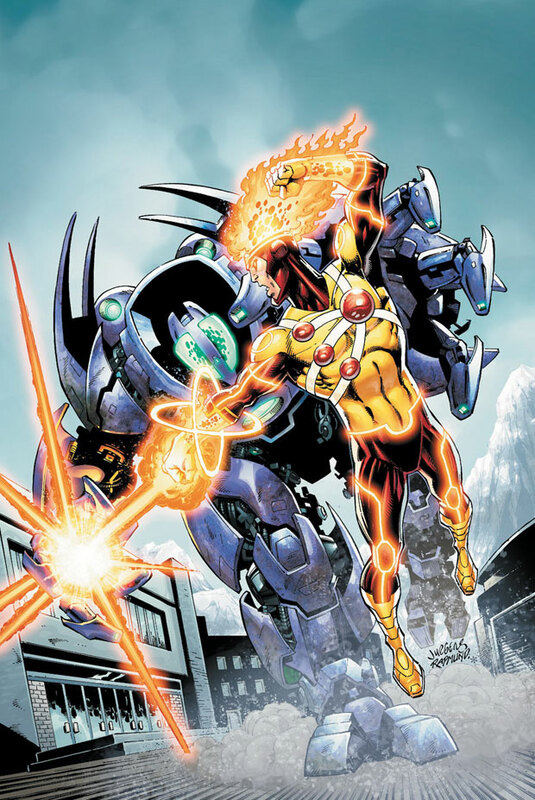 For example: Firestorm is looking off to his right while floating upright; shooting an energy blast with his right hand, while his left hand is raised; battling technological marvels; and so on. Here is the most surprising coincidence… both issues feature a new incarnation of Firestorm! The Fury of Firestorm: The Nuclear Men #13 will feature the new Firestorm incarnation of Ronnie & Jason sharing a single body (this new Firestorm will premier in the issue just prior to #13, The Fury of Firestorm: The Nuclear Men #0). 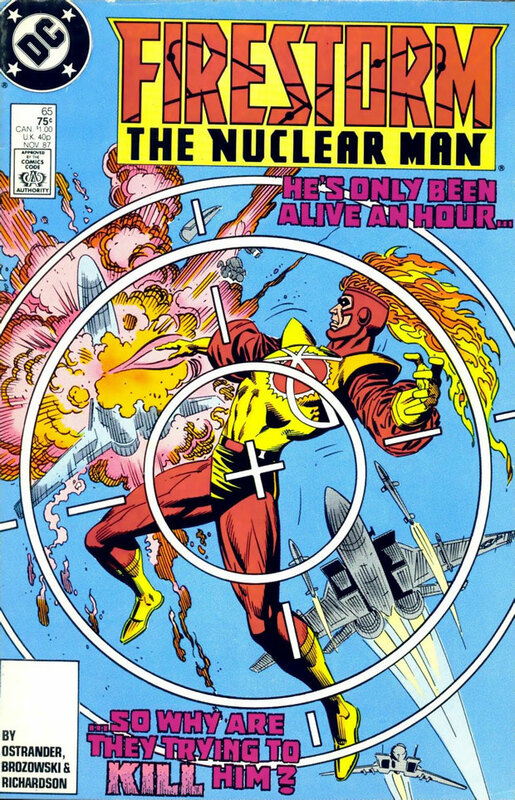 Firestorm the Nuclear Man #65 featured the new “Blank Slate” incarnation of Firestorm (who premiered on the final page of the previous issue, Firestorm the Nuclear Man Annual #5). New Firestorm incarnations and similarities in cover design? Makes you wonder whether the cover similarities are a happy accident or purposeful! My thanks to fellow Match-head Shane Snyder for bringing up this topic! He suggested there might be some similarities between the upcoming cover and previous issues. Posted in: Dan Jurgens, Firestorm #02: Blank Slate (Ron/Mikhail/Stein), Firestorm #10: New 52 v2 (Ronnie/Jason), Firestorm comic vol. II, Firestorm comic vol. IV, Norm Rapmund. My feeling is it’s probably just a happy accident(as the late great Bob Ross used to say.) I think the cover to #13 looks a lot more fun than the cover to #65. 65 has a sense of danger a foreboding to it where as 13 has a sense of excitement and wonder. I have a good feeling for the future of Firestorm. I will miss Joe,Yilderay and Ethan,but I have a feeling Dan’s vision is a lot closer to what Firestorm fans want from the title. this series to me has been one of absolute ignorance, now because of that ignorance from the writer to the editor, this series is tanking. Ethan stated when asked why he made Ronnie and Jason separate Firestorms, he stated he did it because DC allowed him too. That response is just ignorant to me…just because you can, doesn’t mean you should. Anyways after our now 4th creative change (Writers and Artists)…it appears we’ve got what this series should’ve initially have been. Corey is correct, I see more hope than i do any other feeling when i look at Firestorm Vol 4, Issue 13’s cover….but the problem is it never should’ve gotten to this point. There you have it. Just a happy accident! It’s still good spotting, Shag. I was trying to put my finger on what that cover reminded me of, and you nailed it. Nice find Shag! I am very much looking forward to the “new look” Firestorm and so that cover to #13 is pretty well etched in my brain at the moment. I don’t really care for the highlights/segmented costume design look that is shared by Superman, Flash and other members of the Justice League, but I’ll forgive it for the return of a combined Ronnie/Jason red & yellow costume. Ethan Van Sciver has created some amazing designs for DC over the years, but the looks for Ronnie and Jason’s individual Firestorm forms were bland and boring compared to the traditional Milgrom costume. I’m excited for the new creative direction, and I’ll look forward to seeing Ethan and Yildiray on other projects in the future. actually guys the cover i was thinking of was #72. the zuggernaut is reimagined as this robot thing. notice the paler purple and the gem replaced with green glass. one fist and flametop’s head tilted back. even the flames are similar. i’m sure it’s a similarity but this one is like the white album. eerie. My thanks again to Shane for getting me thinking about possible similar covers! How is it that Firestorm hasnt had a movie based on him yet? So much potential!